These are the boundaries which will feature in the next general election, which will reduce the number of seats in Dáil Éireann from 166 to 158. 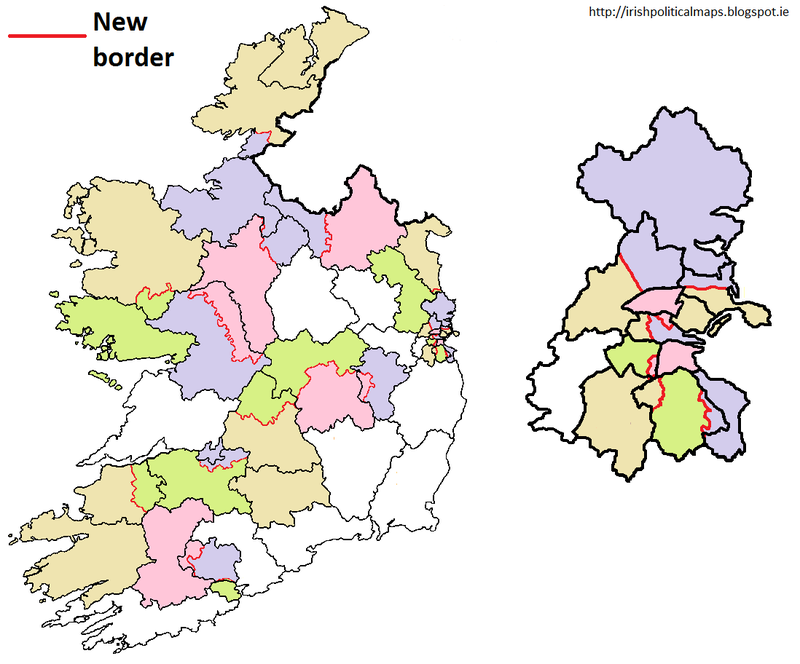 In terms of actual boundaries, only 11 constituencies will remain unchanged or largely unchanged: Carlow-Kilkenny, Clare, Cork East, Cork South West, Dublin Mid-West, Kildare North, Longford-Westmeath, Meath West, Waterford, Wexford and Wicklow. Within some of these constituencies however there will be seat changes. The new seat allocations are described in the map. As was widely expected, Kerry was united in a single constituency, while Limerick City was expanded to include the north east corner of County Limerick. Donegal was also unified, as was most of Tipperary, with the Nenagh area absorbed into the newly independent Offaly constituency, along with the areas of Offaly which had been taken into Tipperary North in the last revision. The splitting of Laois and Offaly marks the end of Ireland's oldest constant constituency. Laois-Offaly had existed since the foundation of the Free State and was first used in the 1921 general election. Cavan-Monaghan sees the Belturbet panhandle go to an expanded Sligo-Leitrim, which also takes a section of Donegal, while Roscommon takes a section of Galway East to become Roscommon-Galway. Galway West gains a part of Mayo, while Meath East gains the southernmost part of the Louth constituency, largely Gormanstown which is a part of County Meath itself. Cork North Central shrinks closer to its original size as its western areas go to Cork North West, while Cork South Central gains a sliver more of Cork City than it previously had. Within Dublin, all but one constituencies are altered. Dublin North is renamed Dublin Fingal and takes the northern half of Dublin West, which itself takes some of a greatly reduced Dublin Central. North Central and North East are combined into Dublin Bay North, while Dublin South East is renamed Dublin Bay South for reasons of symmetry. Slight alterations take place in the boundaries of the other constituencies, with Dublin South also being renamed to Dublin Rathdown. The new constituencies in relation to the current constituencies. Constituencies in white are unchanged.